I am happy to say that my boots have made it through the winter. I can wade through a puddle without that nagging feeling I will have wet feet. I wrote about my changing boot brands here. I got lots of good suggestions on what to do next time when these give out. I love it when my boots don’t leak! Me too! My Blunstones are at least three years old and they still don’t leak……I’ve some like what’s in your picture and they’ve been good too but they’re only a year old. I have a cheap pair ($20) of some off China brand that I bought in Athens, GA years ago. I don’t think I give them quite the business you do every day, but they are still holding up, and my outdoor shoe of choice. I think I got them at the KMart there, come to think of it. Anyway, glad to know about the Bog Ranchers, but honestly? I sure hope these continue to hold up because I really like them. They have a metal shank, so I can still dig a good hole while wearing them. right ankle doesn’t bend much, so am searching desperately for a decent boot that laces all of the way down onto the foot. I know it’ll never hold the water out the same, but it’s not a choice. And man, it sure is hard to find something that looks like it’ll hold up! I’m not a farmer or a fisher, and I live onthe east coast of Canada, where is the usually winter is cold, snowy and sloppy. I can say that my Bogs are dog proof. My dog chewed the tops of my brand new boots a few months ago, and they were fixed with leather patches. I’ve been reading your blog in bits and pieces, as I like to dream about farming. As my sons were growing up, they would “borrow” my muckboots to go feed the horses. Seems like I always ended up buying myself more boots ’cause they would suddenly end up cracked and leaking. Hmmmm…. I hate wet feet! I’m kind of like the goats that way. I just want to know why its always the left foot the starts leaking–I can’t even mix and match. 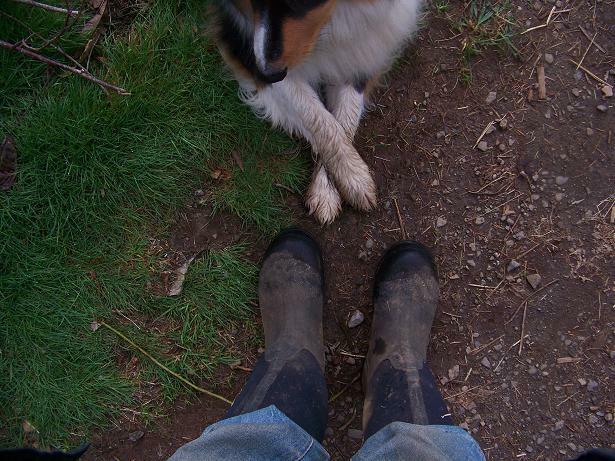 I love my BOGS….they were perfect all winter long….warm and comfy. And I could fit my entire leg in with my pant leg and still have circulation! I love the dogs paws. He is just so precious with his legs crossed, waiting for you to finish with the photo. Can I comment about yesterdays post? First of all I love the picture of the eggs in your hands. The photography in your blog is priceless !!!! I have a blog myself and am trying to get some information out to people who are just learning to garden. But my question to you is this: can I link your information about eggs directly in my post. I have a link on the side so people can visit your blog, but the information about eggs was priceless and I would like to put a direct link in the text to make it more noticeable. Is that okay? Pam, thanks, and certainly you can link to the egg post – the more people that know about good egg handling the better! My muck boots (I think the same ones you are wearing) have now made it through three winters dry and intact. Fantastic! First off I want to say I really love your blog, your posts are so chocked full of wisdom and inspiration. Thank you for sharing your experiences with us!